RESTON, Va – Researchers have developed a new imaging agent that could help guide and assess treatments for people with various neurological diseases, including Alzheimer's, Parkinson's, and multiple sclerosis. 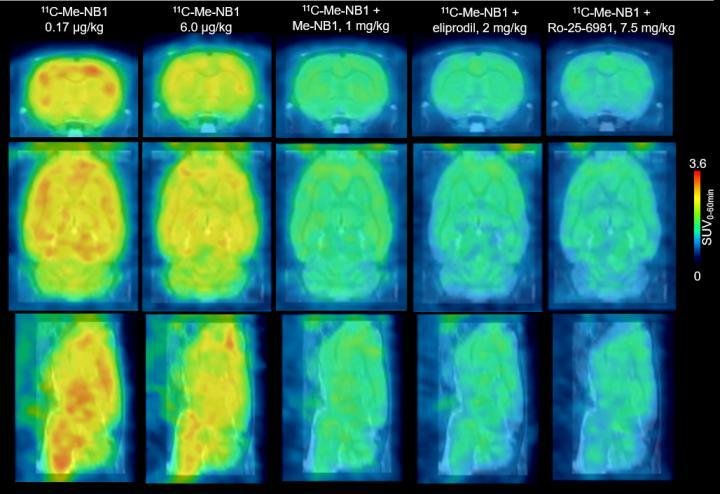 The agent, which is used in positron emission tomography (PET) scans, targets receptors in nerve cells in the brain that are involved in learning and memory. The study is featured in the April issue of The Journal of Nuclear Medicine. Swiss and German scientists developed the new PET radioligand, 11C-Me-NB1, for imaging GluN1/GluN2B-containing N-methyl-D-aspartate (NMDA) receptors (a class of glutamate receptor) in nerve cells. When NMDA receptors are activated, there is an increase of calcium (Ca2+) in the cells, but Ca2+ levels that are too high can cause cell death. Medications that block NMDA receptors are therefore used for the treatment of a wide range of neurological conditions from depression, neuropathic pain and schizophrenia to ischemic stroke and diseases causing dementia. "The significance of the work lies in the fact that we have for the first time developed a useful PET radioligand that can be applied to image the GluN2B receptor subunit of the NMDA receptor complex in humans," explains Simon M. Ametamey, PhD, of the Institute of Pharmaceutical Sciences, ETH Zurich, in Switzerland. "The availability of such a PET radioligand would not only help to better understand the role of NMDA receptors in the pathophysiology of the many brain diseases in which the NMDA receptor is implicated, but it would also help to select appropriate doses of clinically relevant GluN2B receptor candidate drugs. Administering the right dose of the drugs to patients will help minimize side-effects and lead to improvement in the efficacy of the drugs." Ametamey points out, "These results mean that a new radiopharmaceutical tool is now available for studying brain disorders such as Alzheimer`s disease, Parkinson`s disease and multiple sclerosis, among others. It joins the list of existing PET radiopharmaceuticals used in imaging studies to investigate and understand underlying causes of these brain disorders." He adds, "Furthermore, future imaging studies using this new radioligand would throw more light on the involvement of NMDA receptors, specifically the GluN2B receptors, in normal physiological processes such as learning and memory, as well as accelerate the development of GluN2B candidate drugs currently under development." Authors of "Evaluation of 11C-Me-NB1 as a potential PET radioligand for measuring GluN2B?containing NMDA receptors, drug occupancy and receptor crosstalk" include Stefanie D. Krämer, Thomas Betzel, Ahmed Haider, Adrienne Herde Müller, Anna K. Boninsegni, Claudia Keller, Roger Schibli and Simon M. Ametamey, Institute of Pharmaceutical Sciences, ETH Zurich, Zurich, Switzerland; Linjing Mu, University Hospital Zurich, Zurich, Switzerland; and Marina Szermerski and Bernhard Wünsch, University of Munster, Munster, Germany.